My mom's sister has an Etsy site (actually both her sisters are collaborating on it): JustKilnMeCeramics. Check it out and purchase some pottery if you're in the market for such things. Or just enjoy the artful photography of the pieces. 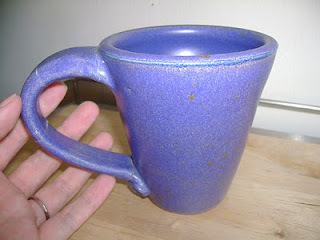 I am quite fortunate to have several JustKilnMe originals -- my favorite coffee mug (which I broke the handle off of, then glued back together), a cup I use to hold change, a vase and a jewelry holder.